For the last few days, global actress superstars Gwyneth Paltrow, Kate Hudson and Zoe Saldana have been in Dubai enjoying time at the beach, exploring the desert and most recently, seeing what Bur Dubai and the Creek has to offer. 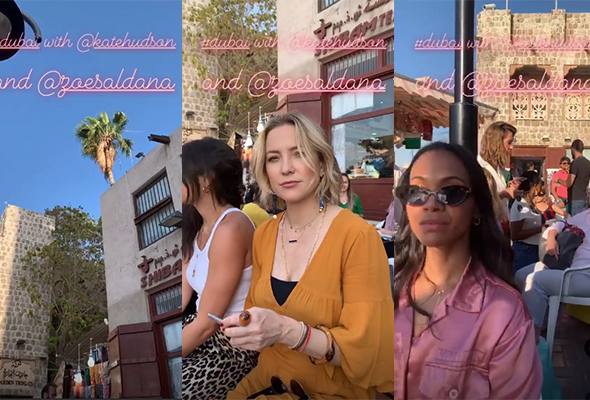 Paltrow shared a quick video on her Instagram Story of the ladies sat in a courtyard, where you’d find plenty of fabric souks and market stalls. This snap with fashion stylist Sophie Lopez suggests they could be shooting the campaign for Happy x Nature on the Dubai Creek. In a video series by Dubai Tourism, Gwyneth Paltrow appeared in the most recent clip which went live in March this year. The video series follows Shah Rukh Khan on a journey to discover Dubai and the final scene sees him pass on a box of coins to Paltrow, suggesting she could be back in Dubai to continue filming for the next part of the story. Gwyneth also took to her Instagram account to share a snap from the beach in Dubai, she appears to be taking pictures of the area when she comes across a jellyfish on the shore. We can’t wait to find out what they’re up to!